My Spanish host mother Clari was one of the most enigmatic women I’ve ever known. Small, dark and rotund, with piercing coal-black eyes and an encroaching colony of facial hair, she was – despite the purplish shade of hair dye she used (which seemed to be de rigeur among brunettes the year I was there) – no shrinking violet. She could in fact be fiercely intimidating, the gruffness in her voice accentuated by decades of smoking Lucky Strikes, her orders taking on a military severity as she barked them to her wayward children. Her emotions were hidden behind a hard-as-nails exterior, occasionally belied by a softness of voice but never expressed overtly to either her spouse or children. It was quite disconcerting to a household newcomer like me, but everyone else seemed to take it in stride. It was with great surprise, then, that after living with her for a short time I discovered that not only did an unguarded back door to her affections exist, but that finding it was as easy as picking up a fork. Within my first week of living there, I had figured out how things worked in Clari’s household. She cooked, people ate. There was no discussion about what was for dinner, no special requests taken or pickiness tolerated. Whether she produced a pot of beans or a perfectly baked fish, her family was expected to eat and be grateful. The problem was that they never were. "Why can’t we ever have Telepizza?" my two younger host siblings would complain daily. "Why do you need to use so much garlic? ", my older host sister would chime in, pedantically redirecting the crispy fried slices to the rim of her plate. "I think you used too much salt this time," my host father would mumble, pouring himself more wine. Clari would just sigh deeply, shrug her shoulders, and turn to me. "Would you like more Melissa?" Of course I did. Her food was incredible, cooked as much by instinct as by experience, and somehow she always managed to take the best part of an ingredient and turn it into a better, more exciting version of itself. Simple vegetables had me practically licking my plate; lentils found their way into my dreams. I don’t know why her own children insisted on drooling over pizza commercials, but in my limited culinary experience this ranked up there with the food of the gods. And this isn’t even taking dessert into account. Although we had dessert every day there were usually only three options: yogurt, fruit, and nuts that you had to crack open yourself. Every once in a while there would be something special – a bar of chocolate, containers of sugary Petit Suisse, homemade vanilla custard, or less popular with my siblings, a wedge of pungent sheep’s milk cheese and a slice of something called membrillo. I’ll never forget the day Clari brought the cheese and membrillo out the first time and smiled at my quizzical look. "This is something very typical of our region," she said, "it’s cheese made with sheep and goat’s milk, which we like to eat with dulce de membrillo." "Dulce de what?" I asked. Membrillo, she explained to me, was a fruit something like an apple or a pear, but very hard – you could only eat it cooked, and when it was cooked with sugar to a firm paste it was called dulce. I shrugged – I had no idea what fruit she was talking about, and even after pausing to find the translation ‘quince’ in the dictionary, I was still just as clueless. She cut me a thick, ruby-red slice from the long slab of membrillo, and asked what kind of cheese I wanted with it. She had two, neither identified by name but just by type of milk and age, both having been cut from large rind-washed wheels. The kids were already reaching for the one marked tierno, a young cheese possessing a supple, creamy texture and mild but somewhat unremarkable flavor. "I’ll take that one," I said, pointing to the other, a cracked, golden wedge surrounded by wrinkled green rind, its pungent scent of sheep, wet floors and hay reaching me clear across the table. She exchanged quick glances with her husband before carving me off a wedge. "This is my favorite," she said quietly, "but I don’t know if you’ll like it. It’s very strong." My older host sister shivered, and turned her gaze away. Clari showed me how to layer slices of membrillo and cheese of equal thickness together. "You could eat it on bread, but I think it masks the flavor", she told me. With everybody’s eyes following, I took a bite. I must have chewed thoughtfully, savoring the contrasts in texture and flavor and marvelling at how floral and fruity the membrillo was and how perfectly it subdued the salty, full-frontal-assault of the cheese. I don’t remember that though, I only remember it being gone, and requesting another slice of each. And another. And being vaguely aware of the corners of Clari’s mouth turning up again and again, every time I did. It wasn’t just good – it was revelatory. From that day forward, there was always queso and membrillo in the house. After lunch, Clari would impatiently ask "what do you kids want for dessert? ", there would be various calls for chocolate or Petit Suisse, neither of which she seemed to buy anymore. My host siblings would grumpily concede to a yogurt or an orange, at which point she would turn to me and say "and for you, Melissa, queso and membrillo?". Upon seeing my nod, her expression would soften and get a little wistful, and everybody at the table would wonder what kind of a spell I had worked on her to always get what I wanted for dessert. Somehow I could never bring myself to tell them just how easy it had been. 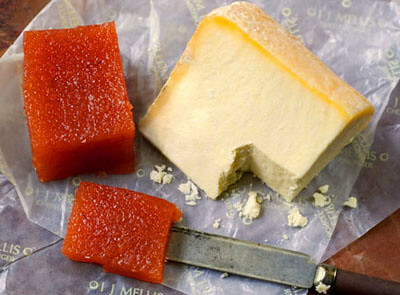 Notes: Dulce de membrillo is eaten all over Spain, usually served in restaurants with Manchego cheese and eaten either as a tapa or as dessert. In Portugal they make something identical which they call marmelada. It’s becoming increasingly available in the rest of the world, usually packed in small shelf-stable plastic containers, but honestly nothing beats it fresh. And it’s so easy! Also, if you’re lucky enough to be in possession of a large number of quinces, there have been a deluge of beautiful quince recipes posted around the blogosphere in recent weeks that look absolutely delicious. Wash the quinces, but do not peel them. Put them into a large pan, and add enough water to cover them by 1 inch. Bring the water to a boil over high heat. Reduce the heat to medium, and cook the quinces for about 40 minutes, until they begin to crack. With a slotted spoon, remove the quinces from the pan, and set them aside to cool. or process in a food processor until smooth. Transfer the quinces to a saucepan, and add the same weight of sugar as fruit. Stir well, and cook the mixture over very low heat for about 1 hour, stirring often with a wooden spoon, until the mixture turns red and very sticky, and there is no visible liquid left. Transfer it to a shallow container (a loaf pan works well for this), and let it cool uncovered. Cut it up when it has solidified, and serve it with slices of pungent cheese. It will keep in the refrigerator, tightly covered, for up to two months. Hi Melissa, well I am proud of you too for eating that stinky cheese! Your stories of your time in Spain never cease to amaze. I wish I had been so daring when I was a teenager. The quince paste recipe looks nice and easy. I’ve never bought quinces before, in fact I’m not sure I would even recognize them if I saw them.. I did have it served to me once in the exact context that you describe, with some manchego cheese, and it was fabulous..(that was in Sheffield of all places!) So perhaps I’ll have to give it a try if I can still find them around Paris. That cheese in your picture looks gorgeous too by the way! What a beautiful post, Melissa, as always. I too love quince paste (most often with manchego), although I certainly have never had it in such picturesque settings, or so close to its source! How good to know that it’s easy to make at home. I’m kicking myself now, though, because last weekend my favorite apple vendor at the farmers’ market had quinces, but I didn’t buy any…and it was the vendor’s last weekend at the market for the year. Grrr. I recently tried membrillo and manchego at a reception. It was delicious! Thanks for the recipe; now I can have it whenever I want. Quince jelly (and guava jelly) were favourites from India when growing up. Your recipe sounds lovely, I may have to try it to see how the styles match up to my memory. Admittedly growing up we never had it with Manchego; a fact that sorely needs to be rectified. interesting, it always seems that the saying “the neighbor’s grass is always greener” applies to food as well….for example, my mother used to tell me that while she was pregnant with me, my former neighbor’s children – Keren & Oren – would always sneak in to my parents place to have some salad, since their mother didn’t do veggies at all, being very stereotypically american. when Stephanie (Keren & Oren’s mother) happened to stop by right after my parents came back from the supermarket, she peeked into the fridge with all the vegetabes and said : “hadn’t I known better, I could swear it was growing in the fridge!”I didn’t appreciate the salad as much, as my mother doesn’t really season her food too well – it was bland, not enough salt, not enough oil, too much lemon juice. so I always prefered eating over at my then “boyfriend” Daniel’s house, as his mother’s salad was ambrosial – or so I thought. Daniel was an overweight child, hated vegetables back then, and he couldn’t stand his mother’s salad. it’s funny how kids don’t appreciate what they have in their house. Hi Melissa, used your/Teresa Berrenechea’s recipe to make the dulce de membrillo yesterday and it came out beautifully. Thank you. It’s definitely a record for me, 2 quince dishes in one season. Had with Idiazabal cheese for dessert last night and then, for lunch, just made a grilled panino/bocadillo with Idiazabal, little bit of membrillo and a thin schmear of romesco. Decidedly not traditional, but resulted in a very tasty sandwich. Hi Tana – Thanks for the heads-up! Melissa, I must confess, with my Anglo-Indian background I can never 100% verify the authenticity of my childhood tastes. I know the guava jelly came from India, but for all I know the quince paste and jellies could have come from my grandmother’s yearly trips to see family in Europe. I just associate it with my time in India, in her kitchen. Dear Melissa, I was given some fat, quinces picked from my cousin’s tree. I thought I’d have a go and making membrillo and went on the hunt for recipes. I followed your’s more or less to the letter. I did omit squeezing the terracotta gunge through a clean, cloth napkin as the thought of trying to scrape the terracotta nectar off the napkin didn’t appeal. I put the membrillo mix straight from the preserving pan and into shallow, parchment lined tins. Hey presto! It looks like the real McCoy. Thankyou for the recipe, easy to follow and one that works. I know this is an ancient thread, but I tried my first quince jelly as part of a cheese plate at Harrod’s today and it was a life changing foodie moment.I shan’t rest until I can find a local source in Canada. Thank you for the recipe and sharing your memories of Spain. I have a very close friend in Iruna and fell in love with membrillo with local Basque artisan cheese while visiting. An acquaintance here in Utah has a quince tree and they had fallen to the ground unused for years. I told him that was a shameful waste so he gave me all of the fruit this year. I’m trying your recipe and will drop off the results with some Manchego at his home so he can have new-found appreciation for the tree in his old orchard. This is a simply elegant recipe with a beautiful memory attached to it, but it obviously calls for some commercial grade of "large" quince. I am trying to harvest fruit from an ornamental quince tree in Western Maryland, North America, where the quince are usually the size of large plums. It took ten of my quinces to yield 5 oz of pureed flesh for the recipe.I often boil fruit and vegetables in the skin before peeling, but will not try this again with quince, since a thick layer of fruit flesh still adheres to the skin and peels away when the skin ‘cracks" according to this recipe. I will peel before cooking in the future. Still, thanks for sharing this taste of Spain and your host mother’s love! I’ve done dulce de membrillo the last two years, as our quince tree produces several pounds of fruit each year. My method is a little different, as I don’t peel but do quarter and core before cooking. There is one thing I have done that works very well: if you bring the paste to a hard rolling boil for 2 min, and use sterile jars & lids, it cans quite well. I like to use 1/4 pint jars because the walls are straight and the jelled paste slides out neatly. Also, it is rich and I’ve had trouble with finishing larger quantities before it spoils.Lastly, 1/4 pint jars make great gifts. Particularly when accompanied by a hunk of Vermont cheese. I love quince but I’ve never tried this. I think I just might have to! By the way, your writing is captivating! I was given some quinces and made quince jelly – in the microwave for the jelly making part – and didn’t want to throw out all that pulp, so had a look on "web" and wow, found your recipe for Dulce de Membrillo. It’s nearly done now, smells wonderful, can hardly wait for it to cool and set so I can try some. Well, it set ok, and tastes delicious – now I need to find some of that Manchengo cheese, but I have tried it with just some tasty cheddar with enjoyment. Taking some for some friends to try tonight. I have never tried to cook Quince, but now that I know how I will try it. I just eat them staight from the tree, they need to be the color yellow. For the first time ever the quince tree in our garden produced lots of fruit – before we've only had a couple of small ones. So, I decided to try this recipe. And it worked a treat. I had some with some goats cheese and am taking more to my parents today, as a replacement for their normal Sunday morning breakfast of bread rolls, cheese and Frank Cooper's marmalade. Did you know by the way that England was importing marmalade from Spain from the early 16C? And at that date marmalade was always made with quince, rather than oranges. So this is probably very like the conserve people would have eaten in Tudor times.